The crack and goat willows and the osiers are native to the British Isles. The beautiful weeping willow is a native of China. It was introduced into England in the 19th century. 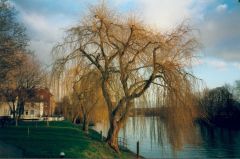 The asperin is derived from willow bark. It's name salicylic acid shows that derivation.